Suddenly, he found himself on board the ship. It was smaller than he had expected. The team spent the night in port and the next morning the Sea-Watch II was due to leave. “We had small bunks with no windows and we were very conscious that once we were on the way there was no turning back”, says Dr Zenses. One person disappeared that very night, leaving no message behind and no reason for his departure, just giving his notice in writing to the Harbourmaster. The doctor from Solingen remained on board. In Summer 2017 Dr Christoph Zenses had taken a break from his medical practice, using his annual leave in order to move South. He went on preparatory courses, on which he also got to know the team with whom he would be setting sail. He planned to spend three weeks on the rescue ship - later christened “Lifeline”- rescuing, helping and above all giving medical treatment. Remnants of a Mediterranean refugee boat. That first night on the ship was the beginning of a journey that was to change the life of the 58-year-old doctor. The next day they travelled on for 24 hours in order to reach the areas in the Mediterranean in which rescue was legal and possible. At sunset he was standing on deck with binoculars and compass, on the lookout for points on the horizon which might reveal the sudden emergence of inflatable boats, at their last gasp and in dire emergency with hundreds of people on board fleeing to Europe. “These people are put on a boat in the middle of the night and told that they just have to cross a river” said Dr Zenses. Instead of that, what actually awaits them is the ocean, the waves and the weather, thirst and death. As a result of hours spent sitting in a mixture of seawater, faeces and fuel oil, these people who had set out in hope, seeking a new home, were left with caustic burns. “You just can’t function properly in those circumstances“, said the doctor, “and neither could I“. He tried to help and give treatment as much as he could, and did not lose a single one of the patients in his tiny clinic on the ship. 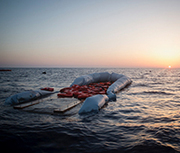 But by no means all of the refugees in the inflatable boats managed to come on board the Sea-Watch alive. Many of them lost their lives on the way. The co-operation among the team was amazing, he said. “It may sound absurd, but the positive attitude among the helpers was actually quite fun“. But there were times when the volunteers themselves reached their limits. The ship had been equipped to carry one hundred refugees, but at times there were up to three hundred on board. “There were more and more of them and sometimes our boat was really tossing about“, Dr Zenses told us. They were at sea for three weeks. 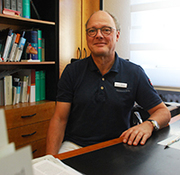 Dr Christoph Zenses at his practice in Solingen. In this he has fundamentally remained true to his own nature. Even during his medical studies Christoph Zenses had already decided “Whatever you are able to do, then it is always possible to do more.” And so he got involved with Aid for Chernobyl – not least because the eldest of his three daughters was born in 1985. “Chernobyl really shook me”, he said. Not only did he collect money and medical equipment, but he also decided to travel there himself. He joined the NGO organisation Pro-Ost in Solingen, which has been working in the Chernobyl region since 1982. Later he travelled to Angola with a children’s relief organisation . “Poverty means ill-health” he says, “and ill-health means poverty.” And because this is not just something that affects developing countries, but can also be found on our own doorstep, he went on to found firstly the Medi-Mobile in Solingen, in order to make it possible for people without medical insurance to receive medical treatment, and then the “Practice without Borders” - all in a voluntary capacity. It was there that he first met refugees who had landed in Lampedusa. “You can’t look the other way” says Dr Zenses. In the following years Dr Zenses, who is a specialist in internal medicine, has received numerous awards – in November he will be presented with the Federal Cross of Merit. “I see this in a small way as confirmation that what I am doing is right and good”, he says, “but above all it draws attention to the issues”. As a result, this has also led to individual people giving donations and to his work being supported by various associations, societies and clubs. In addition to recognising his experience and his age it also affirms his professional integrity, which is so much needed by work with refugees, if it is to function properly. 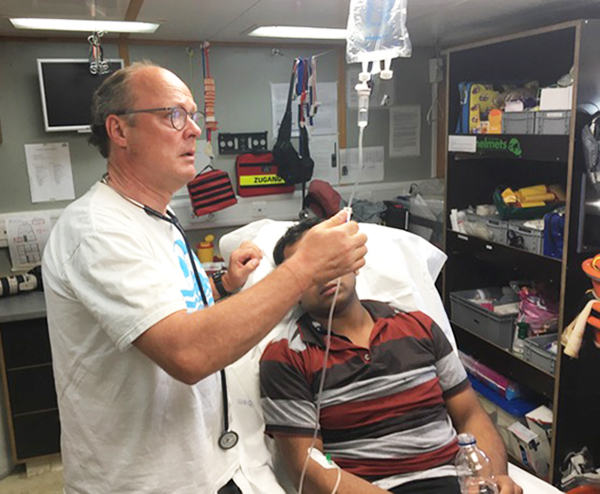 A year after joining the Sea-Watch, Dr Christoph Zenses took another break – helping out for two weeks in the Moria refugee camp on Lesbos. When medication was running short, he would go and buy new supplies on the Greek island. When he heard people talking about having a good future in Europe, he often kept quiet, because he guessed that for many of them the dream would never come true. He has helped many people, meeting those who have been tortured and raped, people who have lost their families whilst fleeing. “Following these assignments, I could not bear to see the pictures on television for a while”, he says. And when the first helpers were arrested as criminals and the Life-line was no longer allowed to operate, then his anger returned. This is what makes the appeal he is making today so much stronger: “Pay attention, take a look, offer help, and, finally, find ways of dealing with this in a humane way.” And that is why he himself will be taking another break. In 2019 he is going back to the Moria refugee camp.